...the essence of what makes a classic by juxtaposing contemporary and multimedia works with the historic interiors of Giovanni Ruggeri's Palazzo Cusani. The first work to confront the viewer is the gigantic work by Diego Perrone, which seems to dialogue smartly with the surroundings, now the private club of military officials. Large white cannons - in color harmony with the courtyard - seem to threaten you as you pass through the street portal, but as you move around this super-size sculpture, the object turns into what looks like a gigantic garden fork. Food for thought (no pun intended, not even an EXPO reference). That is, until I read the title "Fusion of the Bell" (2007) and what the artist intended by it in the free booklet (Italian and English): a reference to the age-old tradition of casting bells. You decide how you want to interpret it. The first room - stifling hot, take a fan - hosts the projected "Hidden Conference" trilogy of Rosa Barba that juxtaposes works of art from antiquity to the present in rapidly changing still and moving images projected onto ca. 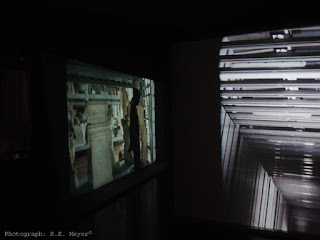 6 foot tall by 12 foot wide screens, so that even the passing visitor or guard becomes a part of this evanescent glimpse at works seen and unseen, wrapped, stored or visible. Even the large projectors positioned around the room contribute to the sense of the past in the present with their ever constant clicking and humming. The room is completely dark to favor the vision of the films, so there is no evident dialogue with the interior. The second room, the Garibaldi room, is quite literally a breath of fresh air, but the light coming from the tall windows interacts delightfully with the glass paste sculptures also by Diego Perrone. This, for me, was perhaps the most traditionally laid out display, yet the interaction of the pieces and the light of the room was one of the most successful, I thought. The room with the photographs was, for me, a great disappointment, but it's not the artist's fault. Armin Linke, according to the little guide provided, was exploring the strata of cultures and time, but the picture on the PR material enticing me to come to the exhibit had led me to believe that I would be seeing THE Laurana sculpture, and not a photo of it. He's one of my favorite Italian Renaissance sculptors, his pieces transmit such beauty and peace. I was really disappointed. Now that you know, you’ll be able to evaluate Linke's installation better than I. In order not to hurt feelings, ruffle feathers, and influence you unduly, I'll say no more. IMHO, some of the installations are quite successful, others so-so, and others not at all, and, since the PR material intrigued me with the idea of a multi-media installation, I would have liked an olfactory interpretation of the classic aspects in each room (if Parma delicately didn't want to push its perfumes, base elements could have been used and explained), but go judge for yourself before it closes much too soon on the 4th of June. It's well worth the trip, before or after Brera for the art gallery and nearby nibbles. The web site of the exhibit is pretty useless. The hours are not listed (and, ahem, I forgot to ask, I just showed up), and the arrows that seem to direct one to further information...don't, but here it is in English, anyway: I'll Be There Forever.